In a beautiful palace of Via San Niccolò, in two steps from Ponte Vecchio, Palazzo Pitti and Piazza Santa Croce, a charming studio of bygone and modern details that allows to live in comfort the city. The apartment is quiet and located inside the courtyard of the palace. 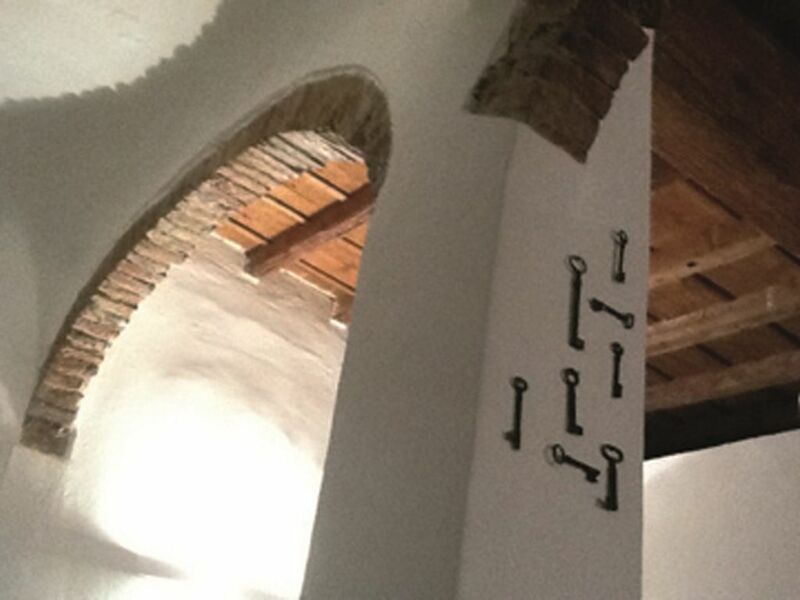 It has all the typical ancient Tuscan flavours, with wooden ceiling beams and arches and niches in brick. The studio consists of an entrance hall with dining area, nice bathroom, old-style kitchen, living area with flat TV and hi-fi, sleeping area with double bed, walk-in closet and extra closet. The spaces are well separated. The bathroom, with details of the highest level (like the stone basin supported by an old wooden desk) has a shower and toilet with a little courtesy shower. The dining table is obtained from a desk for 60 years and two wooden chairs salvaged from an old cinema. The living area is very special place, with a sofa bed just below the ancient window, equipped with balusters, and in front of the TV and hi-fi. Here, moreover, two other wooden chairs in old-cinema-style make the area very comfortable. The kitchen, separated from the rest of the house by a wall with an arch, has in a “Tuscan ancient flavours” style, but with modern character. The accessories are typical objects of the old Tuscan tradition that blend well with a stone basin black with irregular profile. In a natural wood top is recessed on induction hob, with over a stainless steel hood and below a combined oven-dishwasher. The walk-in closet, very large, housed washer-dryer, vacuum cleaner, iron and ironing board. Closed by a soft linen curtain in natural colour is the bedroom. The comfortable double bed with headboard makes a charming alcove with arched brick, highlighted by a discrete light source. Beside the bed there’s a wardrobe with drawers. Appliances: American fridge with two doors, induction hob, suction hood, combined oven-dishwasher, electric juicer, washer-dryer, TV, hi-fi, hair dryer and iron. Kitchen Kit: pots and pans, cutlery, plates and glasses, cups and saucers, knives and cutting tools. Bathroom kit: towels in natural colours. Giulia and her darling young son did everything they could to make my stay comfortable and easy. The apartment was on the ground level and I was delighted to learn that it was once the courtyard for the large property. It is located in the Oltrarno area of Firenze, my ideal place to stay in the tourist hungry city. The beautiful gardens of both Bardini and Boboli are easily accessed from the charming apartment. It is small but the space has been well-planned. It was ideal for my needs and I definitely recommend it to others. Nice apartment in a quaint historic building. Apartment was comfortable and had a nice historic feel with exposed beams and archways. There is a back patio area next to the Bardini gardens that makes a great place to enjoy morning coffee or an evening glass of wine with some charcuterie, cheese and nice bread from the local shops. Very convenient location to tour Florence and some very good local non-touristy restaurants just down the street. Owner was very helpful and I would recommend this for any couple or individual who is looking for a convenient and authentic Florence experience. I spent 2 weeks in this fabulous, safe, efficient apartment where I could walk everywhere I needed to nearby to supermarket, bus stop, Ponte Vecchio, Boboli Gardens + Pitti Palace, Santa Croce, Puerto Romano, San Miniato, Galileo's Observatory, el Duomo,and 2 Mercados to purchase fresh cheese, meats, produce, flower bouquets. This apartment is great for 1 person (or, 2); is completely quiet; with wifi (no cell reception); washer/dryer; oven, dishwasher; full fridge; kitchen equipment if you enjoy cooking; TV; shower; clean; comfortable and Giulia + Pamela are always there to help when anything is needed. For me, it was a special experience to be able to walk only one block early in the morning to see the sunrise over the Arno River and listen to the church bells of Florence! I recommend this location! Compact and quirky, this apartment packs a lot into a small space: comfortable bed, washing machine, fully equipped galley kitchen, desk for computers and comfy couch for recovering from a day of sightseeing. The location is great with restaurants and bars in one direction just a short walk away, a large grocery store in the other. The Hop-0n Hop-Off bus has a stop just two blocks away and a 10 minute walk will get you to the Uffizi and the center of everything. Really the apartment is in a fantastic location - away from the huge crowds but close to it all. Our hosts were extremely helpful and very responsive - answering our query about places to eat with a huge list of options. They also booked a taxi for us for our early departure which came exactly on time. All in all our experience in Florence was greatly enhanced by having this retreat to call home while we were there. Giulia was absolutely lovely. First class service. Giulia was lovely. The apartment is in a fantastic location. And was perfect for what we needed. My one disclaimer is to bring mosquito repellant during the peak seasons due to the old building being damp and there are mosquitoes inside. Mosquitoes were a problem in Florence this summer. I’m waiting for you next summer hoping could be less humid!